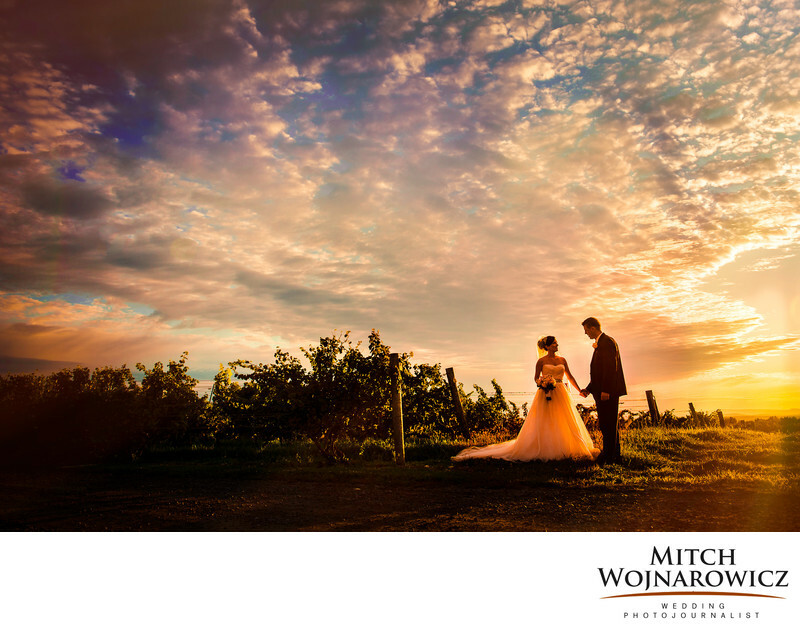 Millbrook Winery wedding photographer.A spectacular fall sunset lights up the evening sky of the Hudson river valley during a Millbrook winery wedding. As a Poughkeepsie wedding photographer at every wedding reception I like to take 10 or 15 minutes where the bride and groom and I go off somewhere alone. It's a nice little pause for the couple who have undoubtedly been enjoying their wedding day, but who may also be feeling like the entire day is turning into a blur. So it's a great thing to take a little bit of time away from the reception to just sort of catch your breath. In the time I like to suggest that happens is during the late today Nice light time...Just before sunset to a few minutes just after sunset is a window of time where stunning wedding photographs can be created at your Hudson Valley wedding. In this photograph the couple and I went a very short distance from where the reception was being held in the barrel room of the winery, and we found a great spot where the sunlight was streaming in, there was a view of the vines, and the sky was lit up by the setting sun...Photographing weddings in the Dutchess County area, I'm familiar with the scenery and the times of day that will make great photographs for you. So don't forget to allow a little bit of time in your schedule to take advantage of great natural light wedding photos. And look for a photographer who understands how to read the natural light and use it to its best advantage to create stunning photographs for you...If you're having a wedding in the Hudson river valley, Dutchess County, Poughkeepsie, or anywhere else in the lower Hudson Valley region, I'd love to talk with you about your plans...Let me have a few minutes of your time so that I can show you how a documentary wedding photographer can produce the kinds of wedding photographs which will remain on your walls and in your lives forever...Send me an email or give me a call today. I would love to talk with you. Keywords: hudson valley (24), millbrook winery (12).